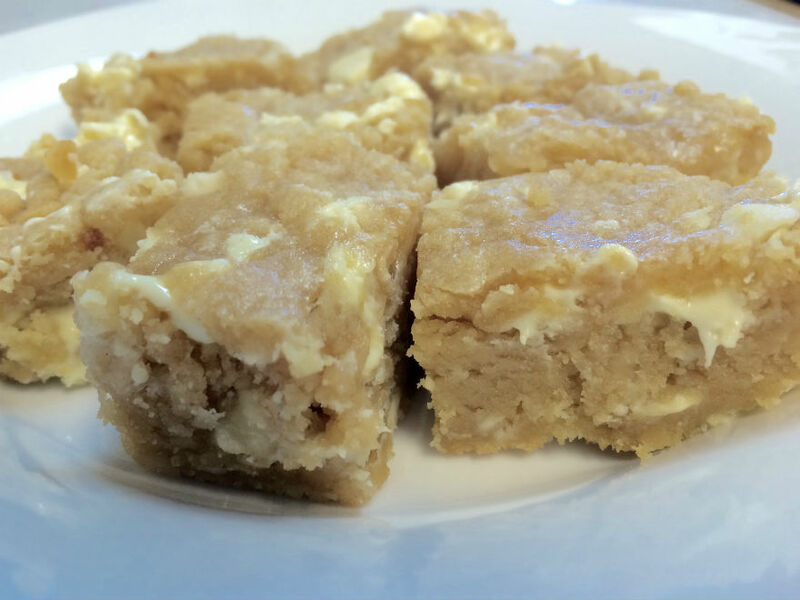 Macadamia White Chocolate Dessert Bars, Made with Coconut Oil. It is always a delight to have a sweet taste of dessert for a snack or after a meal. Often at our house that will include Chocolate Chip Toffee Bars or cookies of some kind. In the mood for something different, I decided to make a cookie recipe into a dessert bar. Using coconut oil for baking has also been a goal of mine. It worked great for these bars. You don’t taste the coconut flavor, though as usual, it seems to add a lightness to the flavor. It took a few tries, with varying results, before I succeeded with this recipe. 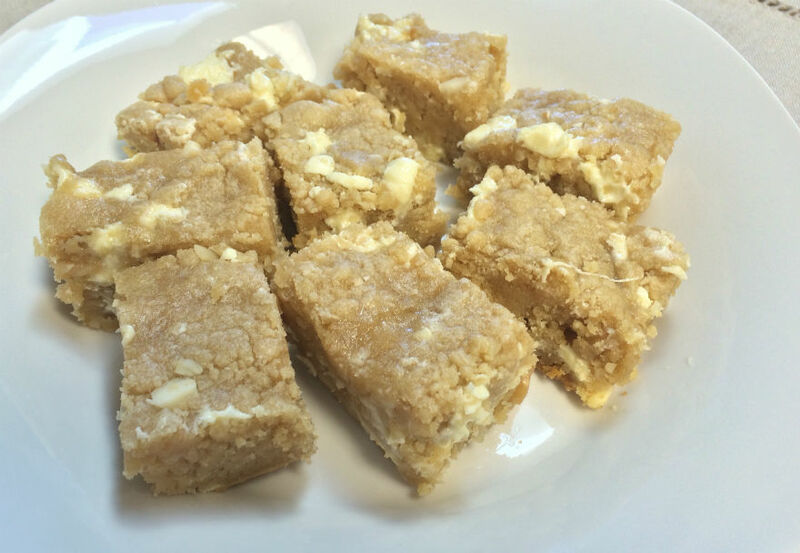 It’s moist and chewy, slightly crisp at the edges, with the lovely taste of macadamia nuts and melting white chocolate chips. A couple of things to note: The dough is fairly dry and crumbly. I added a few tablespoons of water, a little at a time, until the dough clumped together a little more. It will still be crumbly as you press it into the baking dish. Also, it tastes much better soft and chewy when done. In my oven 20 minutes was just right. The first time I made it I gave it just 5 more minutes and it became rather dry. Better to go on the lighter side. These bars can be cut into 1 inch servings for a gathering or for a cookie tray. They make a pretty addition for a party, and wrap up nicely to pack in a lunch. Freeze for up to three months. If you choose to freeze them, you can cut the pan into quarters and freeze in bigger pieces, then pull one out as you need. Oil or spray a 9x9 pan. In a large bowl blend together coconut oil, egg, vanilla, brown sugar and regular sugar. Mix on medium to high speed 4 to 5 minutes until light and fluffy. Add flour, salt, and baking soda, then mix for 1 minute, until just blended. Stir in white chocolate and macadamia nuts. If dough is still too dry, add a tablespoon of water at a time. Press into oiled 9x9 baking pan. Bake 15 minutes, then check every few minutes after that until edges are lightly browned. All you need to make this recipe is a mixer, mixing bowls, and a baking pan. I used my favorite hand mixer, as usual. I love the convenience of a smaller mixer, for handling and space. This one has gotten years of use now and still works superbly. When its finished doing its job, it stores neatly in its case. Since it is only inches wide, that takes up no room at all, plus the case keeps the cord from being all over the place. It hasn’t let me down on any task.